...despite the horrendous spotty downpours throughout the day. Today was my second-to-last early-out Friday and I tried to just live in the moment and get out to enjoy myself. My free Fridays are down to 1 eek! Well, after I got out of work and got some not-so-fun-things done, I put my boots back on and went out to AA to do some last pre-quit shopping. But before that, I discovered something that I probably walked by a million times. Glaser's Bake Shop has been on 1st and e.87th since 1902! I didn't get a chance to eat anything, but next time, I'll let you know how it was. The night soon came around and I asked Amy if she wanted to go to Osha, this cute little Thai place that has these enchanting chandeliers that I always stare at as I walk by. It's on 2nd Ave between 88th & 89th. Such a quiet dignity Amy has here. The one of Amy above reminded me of a combination of two paintings. 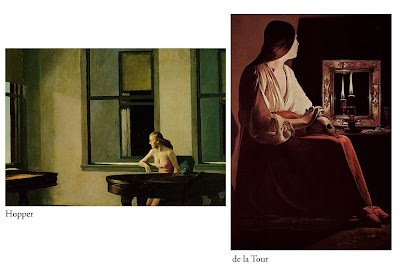 The picture reminded me of the organization of the composition in City Sunlight by Edward Hopper & Penitent Magdalene by Georges de la Tour, French Baroque painter. Something about Amy's skin tone against the dark seat, sweep of her dark hair, and her light blouse, and the frames above her seemed very reminiscient of the two paintings. That de la Tour is like an old friend I must always visit at the Met. ....Sorry, I kinda just nerrrd'ed out there. Enjoy your weekend! Love to hear what you have been up to!